May 25th is the last Paschal Sunday: the Man Born Blind. We continue the baptismal theme and the use of water, but here spiritual blindness is removed as well as physical. It is important to note that the man “was born blind” as this emphasizes the power of the miracle. And we continue the pre-Pentecostal theme as well, because the later history of Jewish Christians being expelled from synagogues is put into this story from Jesus’ lifetime. The Holy Spirit strengthens us in persecution: this newly cured man loses everything because he defends Jesus and the miraculous cure. But when he hears the voice of Jesus, he knows exactly Who this: the only Man who could have done this had to be of God, and so this devout Jew kneels down and worships Him as God. When Jesus was alive, those who believed in Him were not thrown out of synagogues. That happened only in the 80s of the first century. The writer in John’s Gospel takes an incident of his church’s experience and puts it into the time of Jesus’ preaching, in order to make a point to his local church: this is how you should respond, with faith. The young man confesses that Jesus is the Son of God! He is one of the very first in the gospel to do so. He loses everything, but finds strength and peace alike in that profession of faith. Persecution on the basis of religion abounds today, but what most people do not know is this: 75% of all instances of religious persecution are against Christians. What will we be willing to risk if the laws turn against us? The martyrs of the 20th century, and the spiritual heroism of this man who was born blind, will have to guide us and encourage us in the 21st century as we truly see the faith. Caesarius of Arles wrote: That blind man was prepared as a salve for the human race. He was bodily restored to light, in order that by considering his miracle we might be enlightened in heart. In evening prayer tonight, may we offer this prayer to God, that we will always be enlightened in our hearts and do what is right, no matter the cost. Christ is risen! The emphasis in Scripture and the Feast is the commissioning of the apostles to prepare to be enlightened by the Holy Spirit, and to go out into Jerusalem and preach Christ risen while waiting. In the icon, Jesus does not dominate. He is in a mandorla of glory, and shares the scene with Our Lady and the apostles. The icon, then, is concerned with the meaning of the event and its significance for us. Mary is central as is related in the Acts of the Apostles: she was there praying with them. As Mary brought Jesus in his physical body, so she is still His mother ih His mystical body – the Church. It is worth noting that before Pentecost, the Acts of the Apostles tells us that Mary was the spirit bearer for the church. Mary also plays a central role at the completion of Jesus’ earthly mission: she and the angels attend both the start (Christmas) and the end (Ascension). Mary will be with the disciples when the Holy Spirit descends on Pentecost, nine days later. What is the thing around Jesus in the icon? That is the mandorla, which is used to reveal the glory which is beyond vision. This is why the mandorla is also found surrounding Jesus in icons of the Ascension, and also at the Baptism and Transfiguration. In both these cases, the mandorla is not showing something which was seen directly, but represents the glory and majesty beyond what was physically witnessed by the gathered crowds. 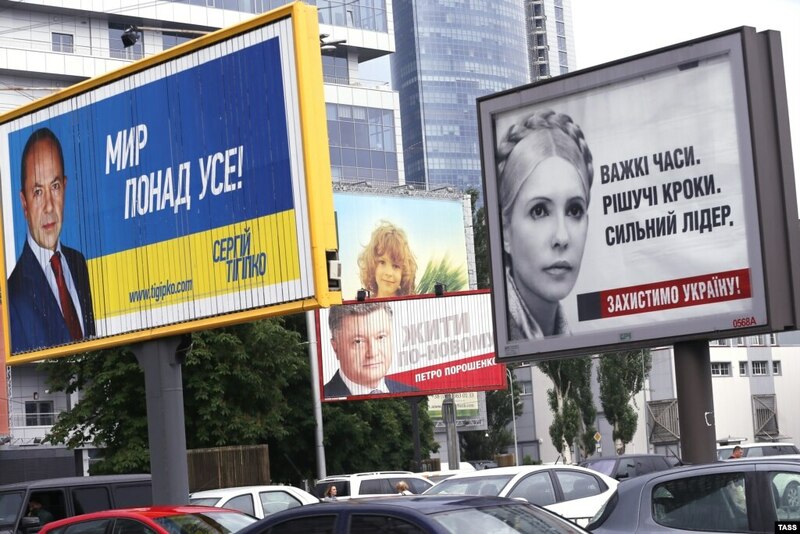 Here is a modern “icon” – billboards in Kiev/ Kyiv of the two real leading candidates in Sunday’s elections: Petro Poroshenko and Yulia Tymoshenko. Both are Ukrainian- and Russian-speakers from southeast Ukraine, Poroshenko is in the lead, and not a fascist in sight – the far right parties poll at 1% — whereas in the EU, they are scoring a lot higher. Go here: http://www.nybooks.com/blogs/nyrblog/2014/may/22/ukraine-edge-democracy/ for Timothy Snyder’s excellent article on what’s happening for real and why it matters to Europe, Russia, and the democratic world. Go here http://www.rferl.org/archive/Ukraine/latest/670/670.html for Radio Free Europe’s English news page on Ukraine. God bless.